The Princely State of Sirmur was an Independent kingdom in India which was founded in 1616. The state was founded by Soba Rawal who assumed the title Rajan Subans Prakash. The state was called Nahan, later on, a new capital was founded in 1621 by Raja Karam Prakash and the state was renamed as Sirmur. The title “Subhans Prakas” was taken by each Raja or Sirmur. The title of Raja and later Maharaja was granted by the British when Sirmur state became a Protectorate under the English crown in 1918. 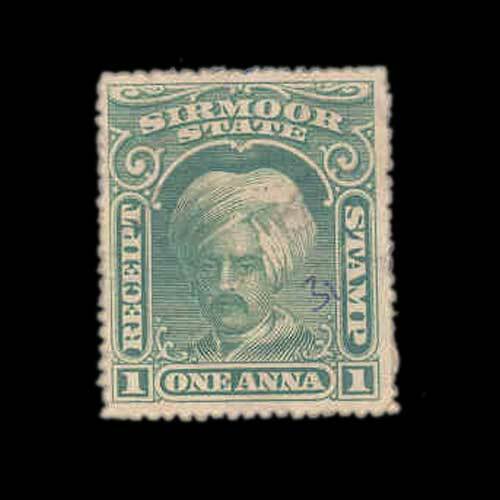 Sirmur also issued the tax or revenue stamps like all other Princely States. The purpose was to collect revenue from people for maintenance and expenditures of state property. The above-shown stamp is a receipt stamp which was used for revenue collection and was acknowledged for multiple payments. Today the state of Sirmur is a district in Himachal Pradesh state. To know more about receipt stamp click here.